Get 10% discount in "Whey Isolate 30G" and save 0,39 zł. Get 10% discount in "Whey Isolate 1KG" and save 10,89 zł. Get 10% discount in "Whey Isolate 2KG" and save 15,59 zł. 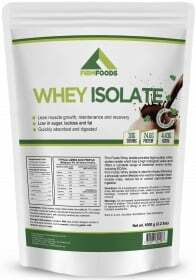 Firm Foods https://www.zumub.com/images/large/firm_foods/firmfoods_100pc_whey_isolate_1k000_LRG.jpg 1FIR9091 Nie ma jeszcze żadnych recenzji. Have a question about Whey Isolate? What is it, what does it do, how and when to use or something else? Ask us. INFORMACJE O ALERGENACH: Zawiera składnik mleka. OSTRZEŻENIA Whey Isolate : Do not exceed recommended dosage. Keep out of reach of children. The product should not be used in case of hypersensitivity or allergy to any of the ingredients of the formulation. Contains sweeteners. Store in a cool, dry place. BEST BEFORE: Please see lot number and expiration date stamped on the packaging.